HA NOI (VNS)— Viet Nam took home three medals for swimming and shooting yesterday in Incheon, South Korea, but neither team's stars made it to gold as hoped. 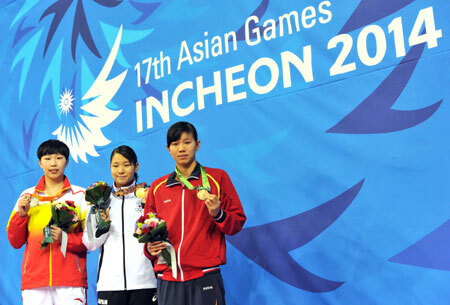 Markswomen snatched two medals in the 10m running target events at the 17th Asian Games. Trio Nguyen Thi Thu Hang, Dang Hong Ha and Nguyen Thi Le Quyen unexpectedly shot 1,106 points, ranking second behind their Chinese rivals, who won with a total of 1,148 points in the 10m running target team event. Three hours later, Hang stepped onto the podium for the second time that day. She won a bronze for the 10m running target individual class, after beating Chinese opponent Yang Zeng in a third-place play-off. Li Xue Yan of China and her teammate Su Li took the gold and silver, respectively, at the Ongnyeon International Shooting Range. The Vietnamese women's medals partly relieved the shooting team's sadness when their key athlete, Hoang Xuan Vinh, didn't perform as well as predicted in the men's 25 centre-fire pistol individual (fifth position) and team (fourth position) events. Vinh, who ranked second in the previous ASIAD in Guangzhou, was expected to repeat his success. Swimmer Nguyen Thi Anh Vien pocketed her second bronze medal at the Games as she finished third in the women's 200m backstroke pool. Akase Sayaka of Japan got the gold, followed by Chinese Chen Jie. Vien also shocked the delegation when she failed to qualify for the final of the 200m individual medley event. She had carried the nation's hope of winning a gold for the event after she took a title at the August Youth Olympics Games in China. Viet Nam's only badminton athlete, Nguyen Tien Minh, advanced to the quarter-final round of the men's singles. Minh, No 23, beat Mustofa Ihsan of Indonesia yesterday 21-19, 21-13 in about a half hour. Next, he will face a huge obstacle: Lee Chong Wei of Malaysia, ranked No 1 in the world, who defeated Parupalli Kashyap of India 21-12, 21-11 in another quarter-final match. Minh and Lee have known each other for many years. In all the matches they've played, Minh could only beat the Malaysian ace once, five years ago.